Samantha Williams was born in Sarasota, Florida, the second of 4 daughters. Her parents are both deceased, but her sisters all still reside in Sarasota, and are all married with children. Samantha had no interest in following the rest of the Williams sisters into a staid lifestyle in Florida. She was popular in high school, being physically attractive and intellectually gifted. Samantha became used to having things easy, and thus college was a shock. Suddenly she was "just another student", instead of the golden girl she had been in high school. It took a while for her to come to terms with this, but eventually she did, deciding that excelling at her studies was more important than popularity. After graduation, Samantha couldn't decide where she wanted to go or what she wanted to do. She floated through several years, trying this and that, but nothing stuck or kept her attention. Finally she actually ran into a Vulcan at the old United Nations in New York City. The Vulcan man, a diplomatic attaché on his first visit to Earth, gracefully answered her questions and an attachment was formed. Salok and Samantha still correspond, and although she would like to take their relationship further, she hasn't yet come up with the courage to act. It was natural then, for her to become interested in the other races of the galaxy and their planets. 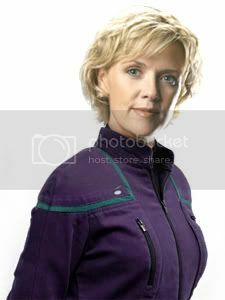 She applied and was accepted at Starfleet, and was then assigned to the NX-04 Challenger when her studies were completed. Samantha began on the Challenger as a Geologists' Mate, but after a year changed her specialty, with the Chief Science Officer's approval, to Exo-Biology.